Workbench Dance presents works in progress by local choreographers. 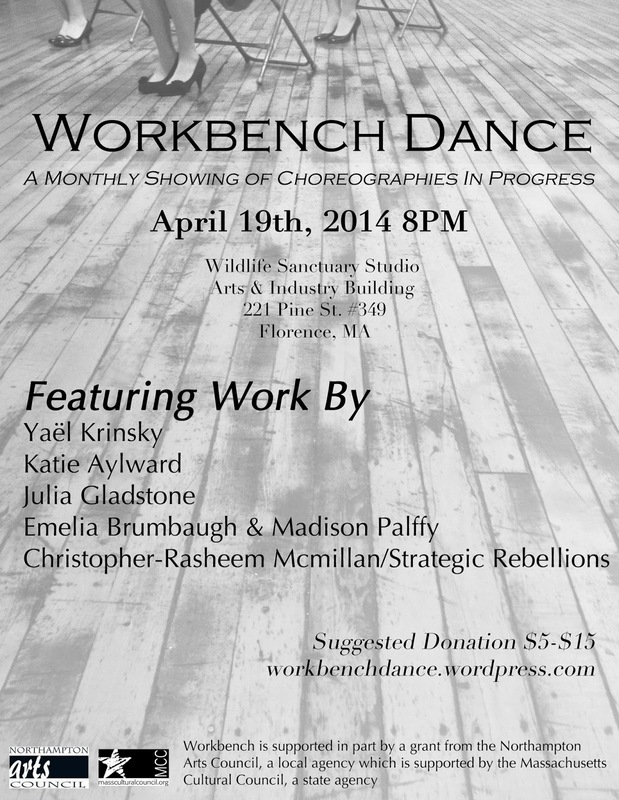 Workbench is a choreographic works-in-progress series in Northampton, Massachusetts. Each month the work of 3-5 emerging to professional choreographers will be showcased. The performances will be followed by a Q&A lead by local artists, and scholars. Our April 19th showcase will feature work by Emelia Brumbaugh and Madison Palffy, Katie Aylward, Julia Gladstone, Yaël Krinsky, and Christopher-Rasheem Mcmillan/Strategic Rebellions. Performances will be followed by an open discussion led by Sara Smith. For more information and to submit work for upcoming Workbench events please visit workbenchdance.wordpress.com. Workbench is supported in part by a grant from the Northampton Arts Council, a local agency that is supported by the Massachusetts Cultural Council, a state agency.